I love salads any time of the year but especially in summer. If I don’t have a salad one day I miss it and I feel like I didn’t eat properly that day. But I know that not everybody is like that. 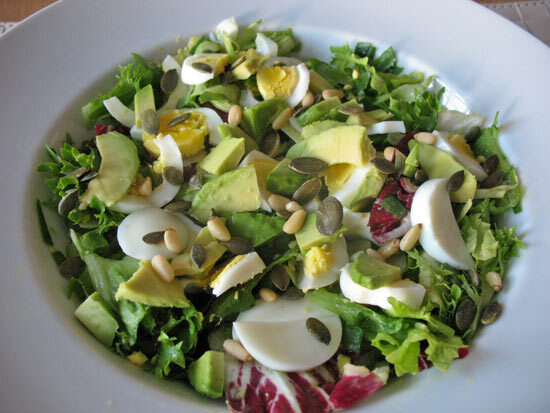 In fact, many people think salads are for rabbits and men especially, are kind of allergic to them! It’s not very ‘macho’ to eat salads, apparently. Well, I am talking from my own personal experience but I do know that not everybody thinks the same. I just wish more people would realise that salads are NOT ‘rabbit food’, they are not all ‘leafy’ and plain. Salads are indeed healthy (well, most of them) but they can also be really satisfying and filling. Even the vegetarian salads. And they can be really delicious and full of flavour, they are not boring at all. They can be full of protein which will fill you up so you won’t feel hungry for a while. This colourful Roasted Aubergine Saffron Salad will no doubt impress your guests. It’s ready in 30 minutes and ideal for a buffet, barbecue or al fresco dining. For the recipe go to The Flexitarian website. What I love about this vegetarian salad from Becca is that it’s full of flavours and textures but also packed with protein. Just imagine crispy roasted new potatoes, crunchy roasted green beans, and big fat butter beans, not to mention juicy roasted tomatoes, milky mozzarella pearls, and an extra creamy homemade pesto dressing. Not a plain salad at all with a wonderful combination of ingredients! For the recipe, visit Amuse Your Bouche blog. 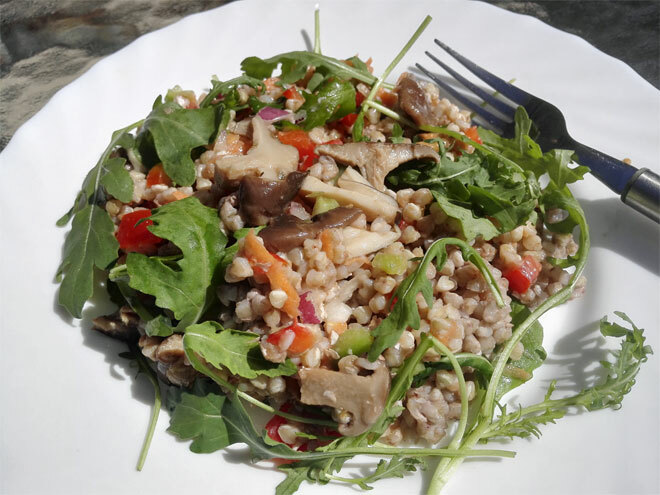 When I first saw this pearl barley salad on Captain Bobcat website I knew I had to make it at home. Roasted vegetables are so yummy and full of flavour and adding them to the salad makes any salad so much tastier. I cannot wait to try this recipe at home, already got myself some pearl barley! For the recipe by Eva go to this page. I created this gluten-free salad last year, after being inspired by Slovenian cuisine. The main ingredient in this salad is buckwheat which is naturally gluten-free and high in protein. I decided to use a variety of vegetables for this to balance the earthiness of buckwheat and the final result was a tasty and really satisfying meal that makes a great lunch for your work. 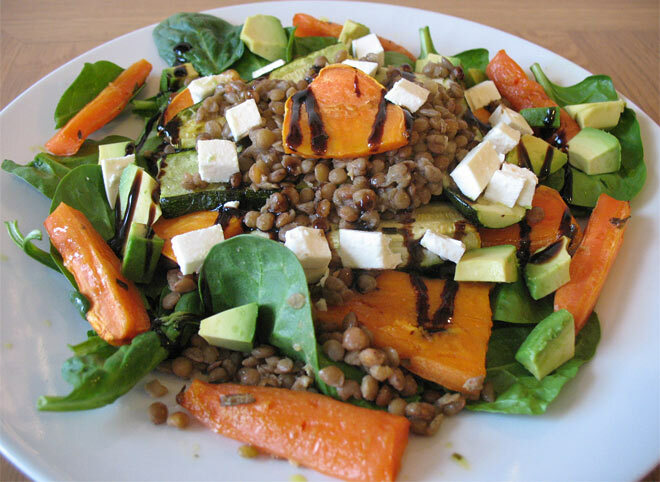 Puy lentils are a great source of protein and really filling so when I saw this salad on Dale Pinnock’s website, I had to share it with you here. 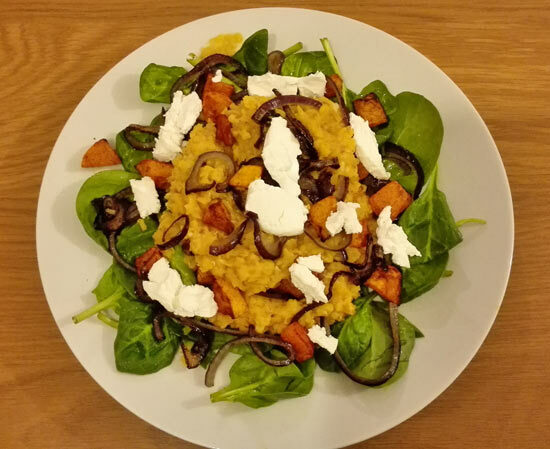 Butternut squash and feta cheese make this salad more flavoursome and although this is perfect for winter, you can also try it in other seasons. For a recipe, visit The Medicinal Chef website. Another warm salad which is also vegan and gluten-free is from Chris James, an expert in the world of health and well being. This salad is packed with spices and herbs and contains a wide range of colourful vegetables. It would make a perfect dinner, delicious and nutritious. You can find the recipe for this salad on my blog here. Another creation of mine, inspired by Healthy Food Guide magazine. Roasted vegetables are always a winner for me and when you mix them together with lentils you can create a really nutritious meal. 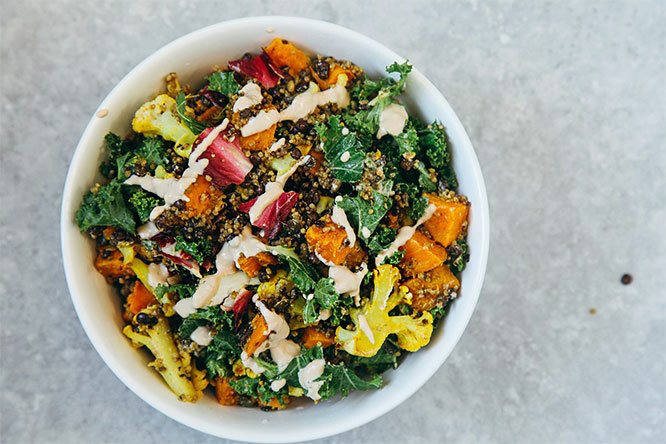 This meal is packed full of beta-carotene due to roasted carrots and sweet potato, so yes, good for your eyes! For the recipe, go to this page. This vegan salad from Vicki (Honest Mum) has a wonderful combination of flavours and textures. It’s really quick to make and it certainly won’t leave you hungry. Great for lunch at work. For a recipe go to this page. 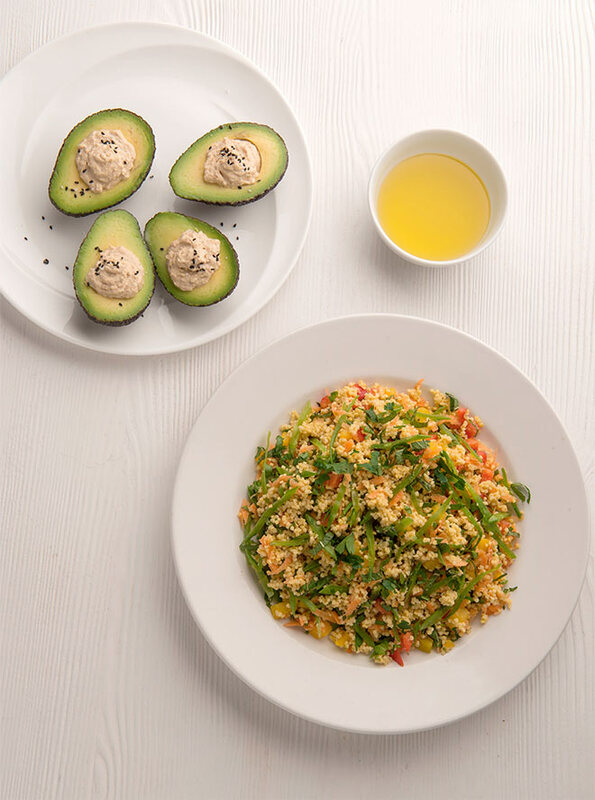 Full of delicious and healthy ingredients this gluten-free Roasted Squash, Quinoa, Avocado and Feta Salad by Eb is perfect for a light lunch or dinner and can be prepared ahead of time for an easy work lunch. Add in a handful of toasted pine nuts or pumpkin seeds to make it crunchy and even more nutritious. You will find a full recipe on Easy Peasy Foodie website. 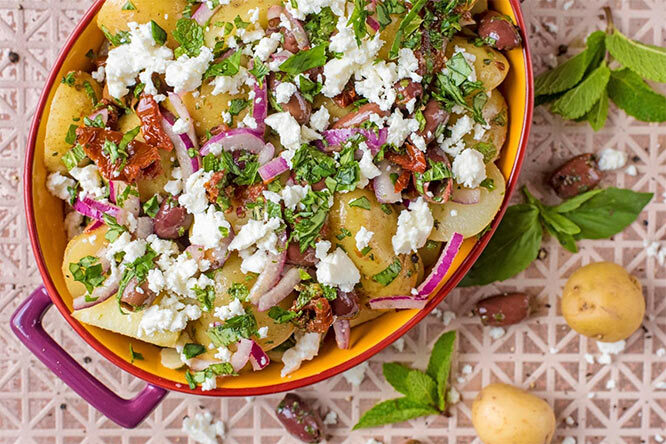 This potato salad from Dannii (Hungry Healthy Happy) has been inspired by Anna Olson (Fresh on Food Network) and contains all of the best flavours of the Mediterranean: olives, sundried tomatoes, lemon juice, feta and a ton of herbs. Try it at home by following this recipe. Another potato salad but this time from Madeleine Shaw. Madeleine put a spin on a classic potato salad and made this salad with asparagus and peas. The tangy dressing matches well with the potato and asparagus, and sundried tomatoes give it that extra flavour. Taken from a book by Amelia Freer, Cook. Nourish. 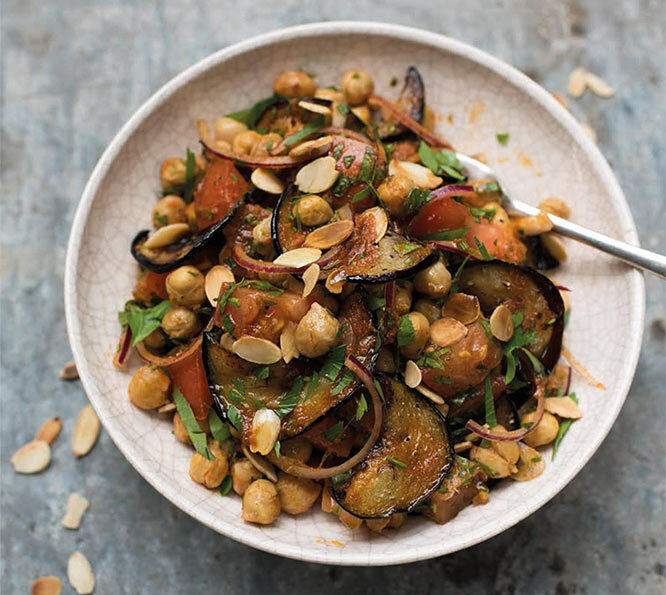 Glow, this Chickpea & Aubergine Salad is easy to prepare and perfect to take with you to work. Chickpeas are a great source of fibre, protein and iron so this filling salad is perfect for vegetarians. This salad is vegan too. Find a recipe for this salad here. 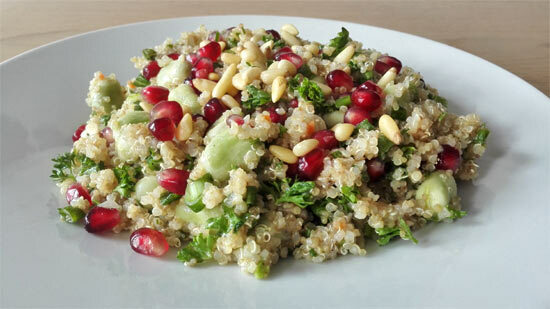 Herby quinoa salad is another one of my creations. Oh, this is simply the best vegetarian salad I’ve ever created myself. It’s so full of flavour and really nutritious. I used herbs such as parsley and mint to make it taste fresh and have added sweet and crunchy pomegranate seeds for that extra flavour. The whole combination of ingredients is amazing. I added pine nuts on top for that extra crunch and flavour. Totally yummy! Find the recipe on my blog here. I really love the look of this salad from Wallflower Kitchen, it’s so colourful and looks yummy too. It’s rich in plant-based protein and really satisfying. An addition of kale makes it super healthy. For the recipe, go to this page. If you want a quick and healthy dinner, this is it. Crunchy egg salad with avocado. I have it all the time as it doesn’t require much effort and it’s really filling (because of the eggs which are high in protein). You could add some feta cheese on top for some extra protein and flavour. 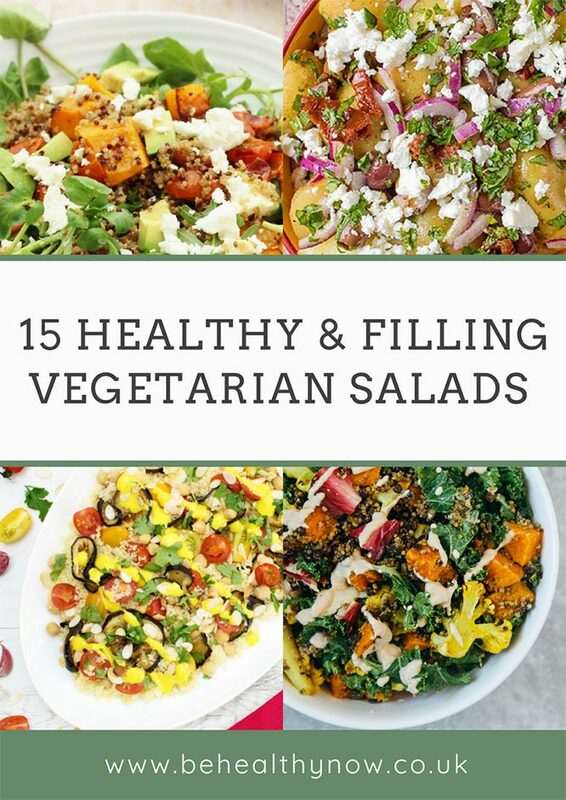 Which one out of these healthy vegetarian salads is your favourite? Great blog thank you for amazing posts.